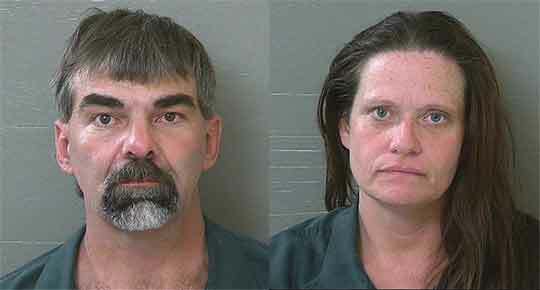 Two North Escambia residents are facing multiple charges after numerous drugs, items of drug paraphernalia, weapons and ammunition were found in a vehicle at a Davisville convenience store. Chad Andrew Giddins, age 41 of McDavid, remained in the Escambia County Jail Thursday morning with bond set at $41,000, while 42-year old Tonya Ladora Foster of Cantonment was jailed with bond set at $20,000. An Escambia County Sheriff’s deputy on patrol in the area of West Highway 4 and Sandy Hollow Road near Davisville reported recognizing Giddins as the driver of a pickup truck. Knowing that Giddin had an outstanding warrant, the deputy turned around and caught up with the pickup on Highway 97 at a gas station at the intersection of Highway 97 and Nokomis Road. The deputy advised Giddins that he was under arrest and grabbed him by the large camouflage jacket he was wearing. Giddins refused to place his hands behind his back, according to an arrest report, even when the deputy placed his taser on his back. The taser was never deployed. With no backup in the immediate area, the deputy requested assistance in handcuffing Giddins from a local farmer that was at the store. The deputy located a cigarette box containing two plastic bags of marijuana in Giddins’ pocket. Another deputy arrived on scene at took a female passenger in the pickup into custody. According to the arrest report, Foster was observed pushing a black bag under the pickup. The bag reportedly contained two bags containing marijuana and eight small bags of methamphetamine. Inside the truck, deputies found multiple pills with no marking that will be submitted to the FDLE crime lab for analysis, a loaded .17 caliber rifles and scope with a chambered round ready to fire, a sunglasses case with a a crack pipe, over 130 rounds of .22 caliber ammo, two 20 gauge shotgun shells, four meth pipes, 30 rounds of .17 caliber ammunition, at least two small bags of crystal methamphetamine, digital scales, syringes, and other drug paraphernalia. Giddins was charged with possession of a firearm by a convicted felon, possession of ammunition by a convicted felon, possession of methamphetamine with intent to distribute, possession of methamphetamine, possession of marijuana, possession of marijuana with intent to distribute, possession of drug paraphernalia, and knowingly driving with a suspended license. Foster was charged with possession of marijuana, possession of methamphetamine with intent to distribute, possession of a control substance , possession of marijuana and possession of drug paraphernalia. Giddins was also charged with fleeing and eluding pole with lights or siren activated, attaching a tag not assigned to the vehicle and driving with a suspended license for an earlier incident on November 2 in Walnut Hill. A deputy spotted Giddins in the Ernest Ward Middle school zone on Highway 97. The deputy followed his as he turned into a residence in the 700 block of North Highway 99. The deputy activated his lights and siren, but Giddins accelerated away,, around the residence and back onto North Highway 99, eluding the deputy. 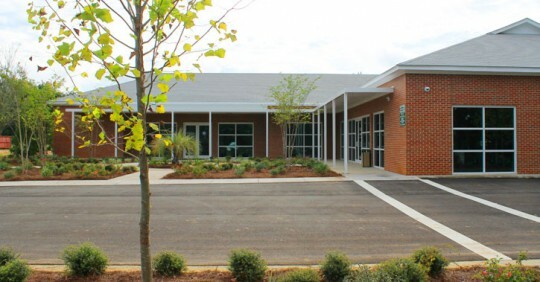 Residents will soon be able to submit original applications and renewals of concealed weapon licenses in the Escambia County Tax Collector’s Office in Molino beginning December 14. While renewal licenses will be printed in the office, new applications still will be submitted to the Florida Department of Agriculture and Consumer Services for final approval. The statutory turnaround time for this process is within 90 days. The Escambia County Tax Collector Molino Office is located at 6440 Highay 95-A North, Suite A, in the Molino Community Complex. Appointments for concealed weapon license applications and renewals can be made here or by visiting EscambiaTaxCollector.com. For additional information on concealed weapon licenses, please click here. Thursday: A 30 percent chance of showers, mainly after noon. Otherwise, mostly cloudy, with a high near 76. South wind around 5 mph becoming calm in the afternoon. Thursday Night: A 40 percent chance of showers before midnight. Mostly cloudy, with a low around 55. Calm wind becoming north around 5 mph after midnight. Friday: Partly sunny, with a high near 71. North wind around 5 mph. Friday Night: Mostly cloudy, with a low around 49. North wind around 5 mph becoming calm in the evening. Saturday: Mostly sunny, with a high near 72. Calm wind becoming north around 5 mph. Saturday Night: Partly cloudy, with a low around 50. Calm wind. Sunday: Mostly sunny, with a high near 74. Calm wind becoming northeast around 5 mph. Sunday Night: Partly cloudy, with a low around 54. Calm wind becoming southeast around 5 mph. Monday: A 20 percent chance of showers. Partly sunny, with a high near 73. Tuesday: A 50 percent chance of showers and thunderstorms. Mostly cloudy, with a high near 71. Tuesday Night: A 30 percent chance of showers. Mostly cloudy, with a low around 48. Wednesday: A 20 percent chance of rain. Partly sunny, with a high near 64. 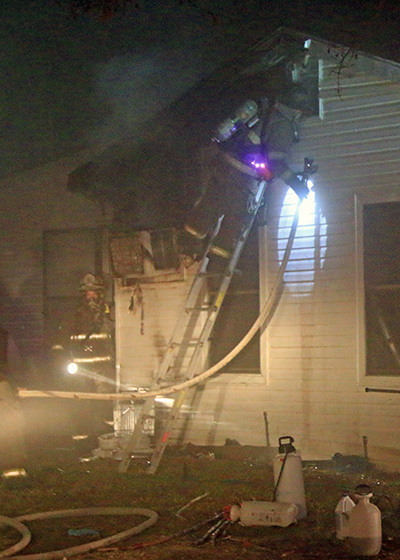 Three people were displaced when fire damaged a home near Walnut Hill late Wednesday night. 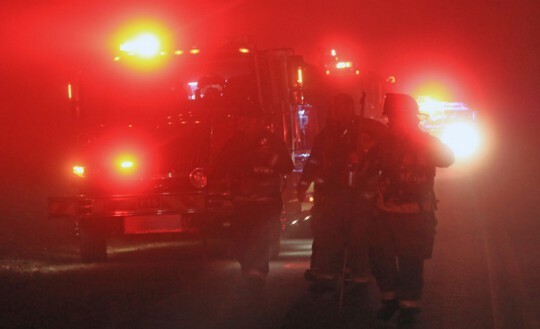 The fire was reported just before 11:30 p.m. in the 6800 block of Pine Forest Road, just north of Garrett Road. 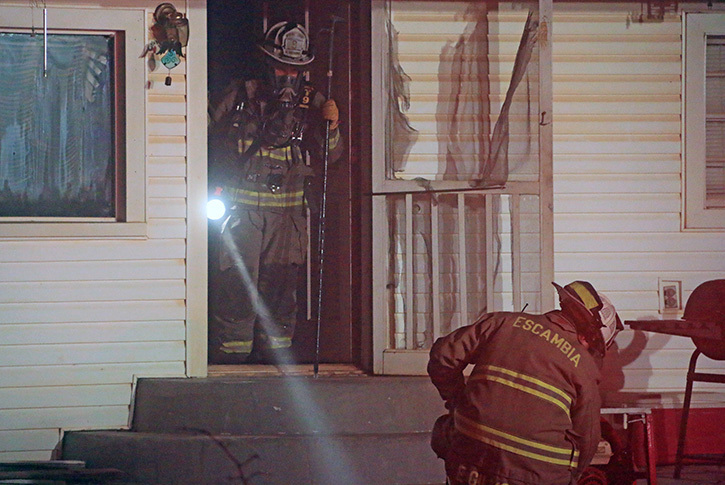 Firefighters arrived to find smoke coming from the 1500 square foot wood frame home. The fire was quickly brought under control. Initial reports indicated that the fire may have started in a window air conditioner. 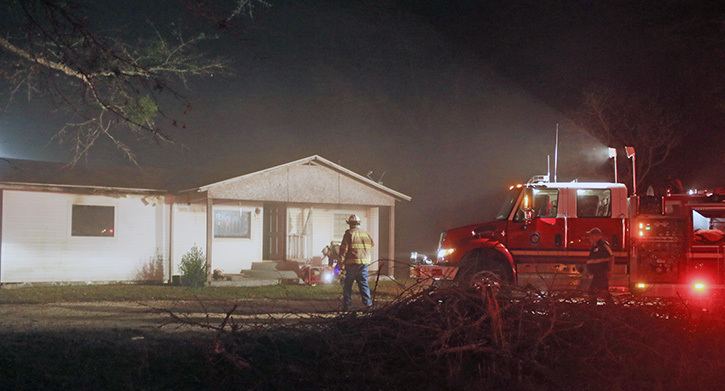 The three adults living in the home were offered temporary assistance by the American Red Cross. One was evaluated on the scene by Escambia County EMS for a minor injury but not transported to a hospital. There were no other injuries reported. 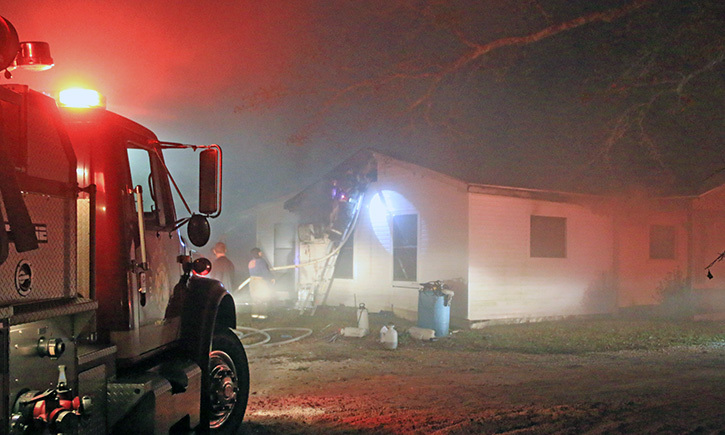 The Walnut Hill, McDavid, Molino and Century stations of Escambia Fire Rescue and the Atmore Fire Department responded to the call, along with Escambia County EMS and the Escambia County Sheriff’s Office. Former Tate High football coach and church youth leader Charlie Maybern Hamrick has been found guilty on six counts of child sexual assault and sentenced to six life sentences. The abuse incidents occurred at a Cantonment church and in the Tate High School locker room. 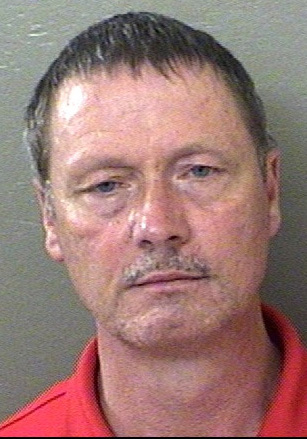 One life felony count of lewd and lascivious molestation was filed over a February 2016 incident at the Harvest Christian Center on Muscogee Road in Cantonment. The male victim, who was 12 or younger, told investigators at The Gulf Coast Kids House that a group of kids were playing hide and go seek outside at the church. The victim was in Hamrick’s lap as the “seeker’ while the other children went to hide. Hamrick placed his hand inside the victim’s pants and underwear and touched him inappropriately, the victim said. The abuse happened only one time and he and his family stopped attending the church a short time later. Authorities said Hamrick was a leader of the “Royal Rangers” at the church. Hamrick allegedly performed a physical exam on a student at Tate High School. A student told investigators that he had waited too long to do his physical to play football at Tate during August 2014. Hamrick allegedly took the student into his office in the locker room and felt around his midsection but never touched his genital area. The victim said Hamrick never said anything inappropriate to him and did not wear gloves during the exam. Another Tate student alleged that Hamrick performed a physical exam on his so that he could play tennis. He allegedly told the boy’s mother that he was qualified to conduct the physical because he was a paramedic. The male student told investigators that Hamrick did the physical in the Tate locker room. Hamrick had him pull his pants down and performed a hernia exam, including contact with private areas. The victim said Hamrick never touch him inappropriately except during the physical exam. And another student said he was attending football camp at Tate when Hamrick performed a hernia exam on him as part of a physical. He told investigators that Hamrick touched him for 4-5 minutes and it was unlike any exam he had experienced at a doctor’s office. The victim, who is currently an inmate at the Escambia County Jail, said Hamrick performed 10-15 “follow-up physicals” during the football season. Hamrick was paid a supplement as a football coach at Tate High School from August 1, 2012, to September 14, 2015. He was not a teacher and did not have students under his watch in a classroom. Superintendent Malcolm Thomas said previously that Hamrick passed all background checks at the time because he had not been charged with any crime. 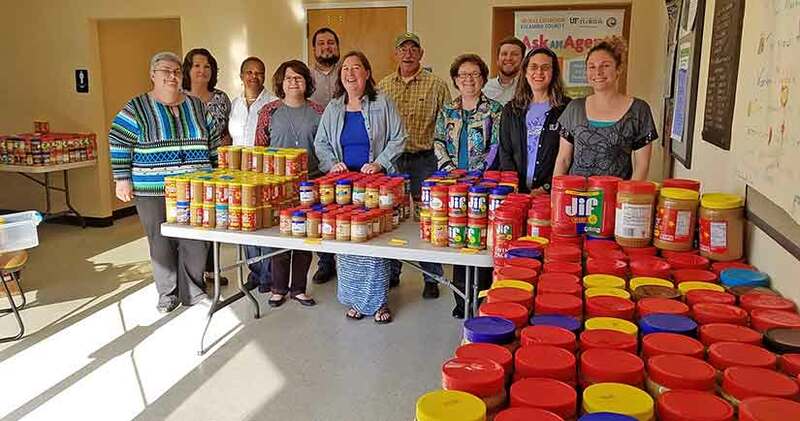 Well over a ton of peanut butter was collected in Escambia County during the recent UF/IFAS Extension Annual Peanut Butter Challenge. Escambia County residents donated 1,598 jars (2,495 lbs), while 744 jars (1161.8 lbs) were collected in Santa Rosa County. In mid-December local peanut producers Rodney and Mike Helton will donate additional pallets full of peanut butter they purchased for the Escambia County challenge. All of the peanut butter will be donated to local food pantries. Pictured: A small portion of all the peanut butter donated by Escambia County residents. Photo for NorthEscambia.com, click to enlarge. Thursday is the last day of the highly active, deadly and destructive 2017 Atlantic hurricane season, but most Floridians will feel its impact for years. Politicians are still scrambling to determine how much of the next state budget will be dedicated to covering losses that may or may not be paid by the federal government. The massive hit from Hurricane Irma caused direct physical and emotional impacts in Florida, and ripples continue to come ashore as thousands of people flee Hurricane Maria’s devastation in Puerto Rico and the U.S. Virgin Islands. 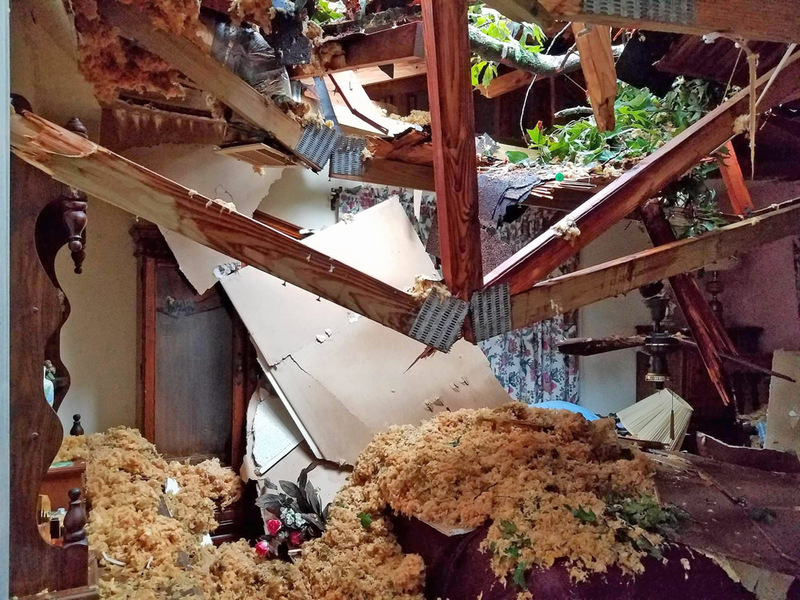 Lawmakers are also looking at regulatory changes for nursing homes and debris-removal companies, as well as changes dealing with issues such as evacuation lanes, shelters and a potential state fuel reserve. Gov. Rick Scott, who was a constantly visible face before and after Irma struck, said Monday while in Tampa that he’d like to boost the availability of propane for generators before the 2018 storm season. Visit Florida spent $5 million to tell potential tourists that the state quickly reopened after Hurricane Irma, even as scars from the September storm remain etched across agricultural fields and the Florida Keys. Meanwhile, 72 deaths in Florida are currently attributed to the Irma, according to reports supplied by county medical examiners to the state Division of Emergency Management. The fatalities include 14 cases involving carbon monoxide, eight drownings, four electrocutions and 14 incidents involving blunt-force injuries. 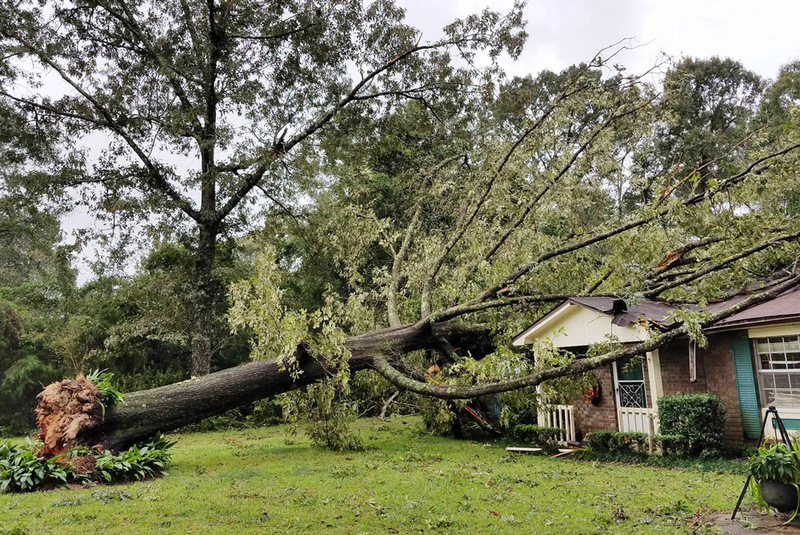 Deaths occurred statewide, with six in the Florida Keys, five in Duval County and even two in Leon County, which sustained relatively little damage from Irma compared to other parts of the state. The numbers don’t include 14 deaths of residents of a Broward County nursing home — 12 were recently ruled homicides — that have caused Scott to push for new rules requiring nursing homes and assisted-living facilities to have emergency generators. Members of the House Select Committee on Hurricane Response and Preparedness will meet Monday and discuss potential storm-related recommendations for the 2018 legislative session, which starts in January. Among the possibilities are legislation about housing, agriculture tax relief, hardening for emergency-operations centers and management of shelters. Hurricane Hermine in 2016 was Florida’s first direct hit from a hurricane in more than a decade. But Irma, which made landfall Sept. 10 in Monroe and Collier counties and traveled up the state, was far more destructive. Mark Wool, the warning coordination meteorologist at the National Weather Service’s Tallahassee office, called 2017 the busiest for the Atlantic since 2005. Emergency-management officials each year stress preparing for hurricanes. But Wool said the flatness of Florida requires additional vigilance by coastal communities against flooding, as the state is also experiencing a period of rising sea levels. As of Nov. 13, more than 830,000 property owners across the state had filed claims for $5.88 billion in insured losses from Irma, which was one of four storms — Tropical Storm Emily, Irma, Hurricane Nate and Tropical Storm Philippe — that had a direct impact on the state during the six-month hurricane season that closes Thursday. Overall, there were 17 named storms this year. The most devastation came from Harvey’s Aug. 26 landfall in Texas, Irma’s double landfall and run-up of Florida starting Sept. 10, and Maria’s destruction of utilities and other infrastructure across Puerto Rico on Sept. 20. While spinning in the Atlantic, Irma reached maximum sustained winds of 185 mph, a pace it held for a record 37 consecutive-hours. Nate also set a record in October for the fastest forward motion recorded for a hurricane in the Gulf of Mexico. Irma also set new benchmarks for evacuees — an estimated 6.5 million people left their homes in advance of the storm — and power outages and restoration crews. Florida Power & Light, for example, reported 90 percent of its customers — about 10 million people — were without power on average 2.3 days. The agriculture industry has put a preliminary estimate of $2.5 billion on its losses from the storm. However, Florida leaders have yet to convince the White House and Congress to include an estimated $761 million in losses to the citrus industry in a series of disaster-relief packages this year. State Agriculture Commissioner Adam Putnam again implored Florida’s congressional delegation on Tuesday to support U.S. Rep. Tom Rooney’s proposal to add $1.5 billion for Florida’s agricultural industry to a $44 billion disaster-relief request sent to Congress on Nov. 17 by the White House Office of Management and Budget. While awaiting federal assistance, Scott authorized a $25 million interest-free loan program for citrus farmers. Visit Florida, meanwhile, directed $5 million from its tourism budget for a special post-Irma marketing campaign, and Scott has requested lawmakers boost Visit Florida’s marketing dollars from $75 million in the current year to $100 million because of the need to have post-disaster marketing money readily available. Despite the state saying tourism numbers continue to climb, hotels remain closed in parts of the Keys, where housing issues have grown for workers after Irma devastated a number of areas outside of Key West. The Islamorada Resort Company, which hired more than 500 construction workers to repair storm damage at four locations on the islands, is reopening the first of the four on Dec. 15 and the second a month later. “We are thrilled to welcome guests back to our slice of paradise,” said Eddie Sipple, the company’s area general manager. 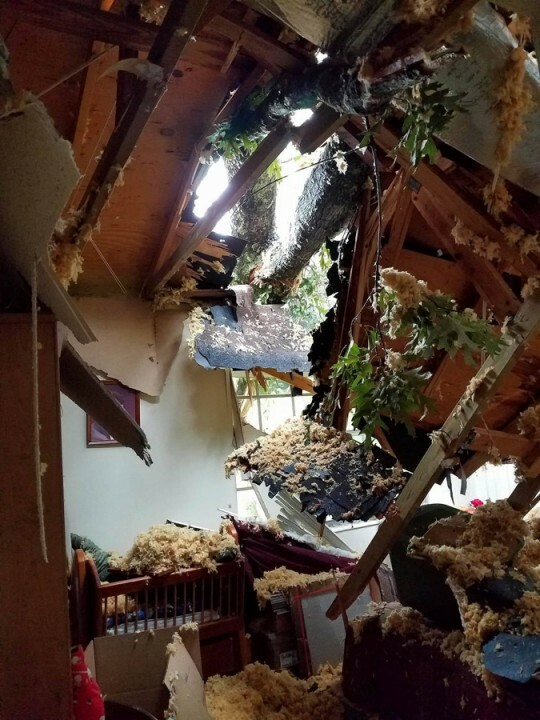 Pictured: A Cantonment woman escaped injury when a large tree fell into her home due to Hurricane Nate – one of the very few damage reports received from the storm in the North Escambia area. NorthEscambia.com file photos. It’s beginning to look a lot like Christmas in the main hallway at Northview High School. 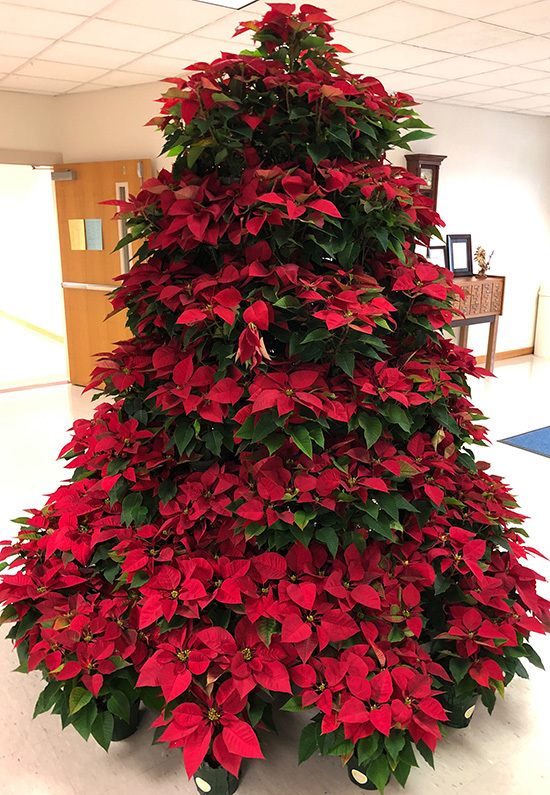 The Northiew Beta Club sold 150 potted poinsettias as a fundraiser to create this living poinsettia tree. Photo for NorthEscambia.com, click to enlarge. A state panel Wednesday backed a proposed constitutional amendment that would change residency requirements for legislative candidates. Under the proposal, candidates would have to reside in the districts they intend to represent at the time they qualify to run. Currently, they are only required to live in the districts when elected. The change would not be required in years of legislative redistricting, which often leads to substantial changes in district boundaries. The proposal is now ready to be considered by the full 37-member Constitution Revision Commission, which will determine whether it will go before voters in November 2018. The commission, which meets every 20 years, has the power to directly place proposed constitutional amendments on the general-election ballot. Diaz pitched the proposal after former state Rep. Daisy Baez, D-Coral Gables, resigned her seat amid scrutiny about her residency. Baez, who was elected in 2016, resigned after pleading guilty to a perjury charge in an investigation by the Miami-Dade County State Attorney’s Office. Diaz has said the proposed constitutional amendment was not spurred by the Baez case. The issue of residency of lawmakers has been an almost-annual source of rumor and contention. In 2013, Sen. Jack Latvala, R-Clearwater, sought an investigation into residency claims by six South Florida lawmakers, two fellow members of the Senate and four from the House. All six were Democrats. 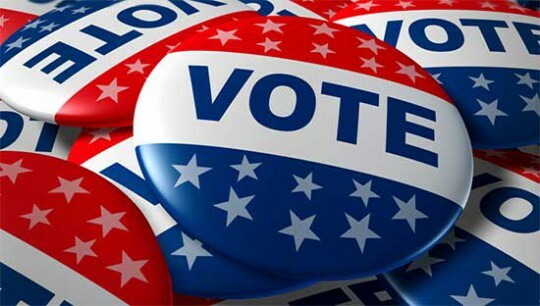 The language also says residency requirements must be met “upon election,” which has been taken to mean as either when election results are certified or when a candidate was physically sworn into office. Mr. Randy Theo Covan, 56, passed away Tuesday, November 28, 2017, in Brewton, Alabama. Mr. Covan was a native of Century, FL and had resided in Brewton, AL since 1985. He was of the Holiness Faith. He is preceded in death by his brother, Ronnie Hayes. He is survived by his parents, Bill and Alene Covan of Century, FL; three sons, Jason (Wendy) Covan of Brewton, AL, William (Jennifer) Covan of Uriah, AL and William Robbins of Brewton, AL; two daughters, Tina (Jason) Johnson of Thomasville, GA and Tasha (Jesse) Benoit of Gueydan, LA; one brother, Raford (Tina) Covan of Pace, FL; one sister, Recinda (Buck) McCormick of Milton, FL; and nine grandchildren, Tara Johnson, Jason Johnson, Jr., Christopher Benoit, Zachary Benoit, Ryan Covan, Cheyanna Covan, William “Cole” Covan, William “Jr” Robbins and Miranda Robbins. Funeral services will be held Sunday, December 3, 2017, at 2 p.m. at the Petty-Eastside Chapel Funeral Home with Rev. Jimmy Collie officiating. Burial will follow at the Providence Methodist Cemetery. Visitation will be Saturday, December 2, 2017, from 6 p.m. until 8 p.m. at the Petty-Eastside Chapel Funeral Home. Pallbearers will be John Lee, Billy Davis, Will Chavers, William Robbins, Rick Garrett, Mike Hammond and Thomas Carroll.